When you’re planning your hiking trip, thinking about the boots and socks you’ll wear is one of the first things that comes to mind, but planning what socks to wear for hiking in water is another story. Having wet socks is one of the sensations that nobody is fond of, but when you’re hiking in different terrains, it may be something that cannot be avoided. That’s why finding the best socks for hiking in water is a smart idea. To find the best socks for hiking in water, you need to start with what constitutes a good pair of hiking socks in the first place. As you’re probably aware, socks come in different makes and are designed with specific purposes in mind. Hiking demands that your equipment is made with a certain amount of stamina, and your socks are no exception. Waterproof: it goes without saying that if you know you will be spending the majority of your hike trekking through water, then you should invest in a pair of waterproof socks. Whether the temperature is warm or cool, keeping your feet dry during a hike will leave you feeling more comfortable overall, and make the duration of your hike more manageable. Material: when hiking through water, you want to make sure that your feet feel as free as possible in terms of flexible and fast movements. One of the best ways to ensure this is to choose socks made of breathable and lightweight fabrics. Steer clear of cotton, as it takes very long to dry and will hold moisture. 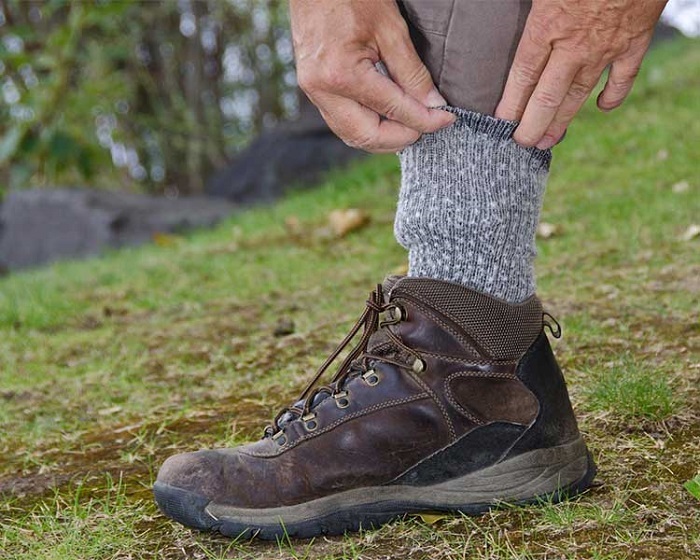 Thickness: while lightweight socks may be more practical in the warmer months, if you find yourself heading out on a water hike in colder temperatures, you will definitely want to choose socks which are crafted thicker. Fit: any socks you choose to wear while hiking should fit snugly without leaving your feet feeling constricted. Your feet are doing most of the heavy work while hiking, so keeping them comfortable should be your main priority. The RANDY SUN waterproof hiking socks are an affordable option suitable for both men and women. These socks are available in a collection of interesting colors and patterns to suit your preferences. The RANDY SUN socks are made of high waterproof nylon, and are very lightweight and breathable, making them an ideal option even for hot temperatures. There’s no need for you worry about your feet smelling after a long day of hiking with these socks, as they are made with anti-bacterial technology. To keep these hiking socks clean, you can choose to hand wash them or put them in your washing machine if it’s more convenient for you. If you’re looking for a thicker pair of socks, these will fit the bill. Make sure to check out the sizing chart carefully before purchasing! The WATERFLY waterproof socks are another pair that works for both men and women to keep feet dry on the trail. These socks are designed with three layers. The outer layer is mainly nylon, the middle layer is waterproof and breathable, and the inner layer is a combination of wool and nylon for durability and comfort. These affordable hiking socks come in a few striking colors which you can take your pick from. The WATERFLY socks are designed to be lightweight and elastic, providing you a comfortable wearing and hiking experience for your feet. These socks don’t require difficult upkeep. You can hand wash or machine wash them based on your preference. Keep in mind that the listed sizing is based on men’s feet, so adjust accordingly! Click here to view WATERFLY Waterproof Socks on Amazon. If you’re looking to invest a little more in the perfect pair of socks for hiking in water, consider the Dexshell socks. These socks are made with 3 layers, the middle of which is a waterproof Porelle Membrane, which is sure to keep your feet nice and dry. Although these socks are lightweight, they are durable and thermal, as well. These socks are hand wash only, so ask yourself if that is manageable for you before buying. Remember, the socks remain waterproof as long as the water stays below the sock’s top level! Click here to see the pricing for the Dexshell Waterproof Hiking Socks on Amazon. The ZEALIYUE waterproof socks are an affordable and stylish pair for both men and women, made with a 100% waterproof membrane. Not only will these socks keep your feet dry, but they are made with anti-bacterial technology to prevent an unwanted odor from popping up after a long day of hiking. These socks are good for all climates, as they are lightweight, thermal, and windproof. These socks can be cleaned by hand or in your washing machine, depending on what’s easiest for you. You are sure to find that the ZEALIYUE socks serve you well in many hiking environments. For total simplicity, check out the Always Outside waterproof hiking socks. These black socks are 100% waterproof and made to be breathable and lightweight. These socks are crafted to fit your feet well without feeling too tight. Keeping these socks in top shape is easy, as you can just toss them in the washing machine. Be sure to look closely at the sizing chart before ordering so you get the right fit. The Always Outside hiking socks are comfortable and convenient. Hiking in the water can be an exciting experience, as long as you’re properly prepared. Your feet will work hard to help you explore new places, so treat them right. Invest in a reliable pair of hiking socks and hit the trails!